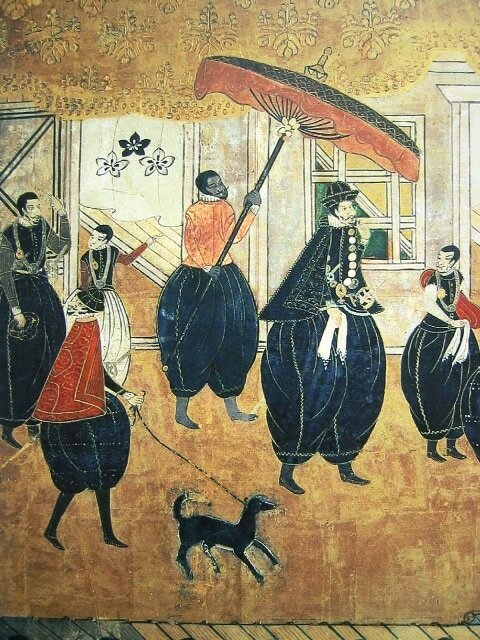 ​The relatively short Azuchi-Momoyama era (1573 - 1600) was a time of violence, but also of artistic excellence. Many view it as a golden era of Japanese pottery. These were the days of civil war in Japan. Highly skilled potters fled to the Mino region, the home of Tajimi, to escape the savage fighting in neighboring areas. These ceramics masters began producing crockery for the tea ceremony with ever greater technical excellence and attention to aesthetics. The tea ceremony - as peaceful as it may seem - had become a ritual central to political maneuvering in these dangerous times of civil war. And in the midst of that space, we find the highly valued Mino tea bowls and kettles. As objects of status and desire, they were consciously used as rewards and as tools for persuasion in the power game of civil war. And the tea room became the stage for it all. In this compact demonstration of Chado, the Japanese Tea Ceremony, you can see how the tea bowls are turned by the guests before drinking, so that they can enjoy the beauty of the bowl. Master potter Kato Kagemitsu (1513-1585), who relocated to Mino in 1574, escaping from the fighting in the neighboring Seto region, became the personal protégé of Oda Nobunaga (1534 – 1582). Nobunaga was the first of the three giants among the war lords who helped unite Japan during the Azuchi-Momoyama era. Kato introduced styles that would come to be regarded as some of the finest in the world of Japanese pottery. "[Kato] introduced [...] classic ceramics [in Mino]: Setoguro (black Seto), Ki-Seto (yellow Seto) and Oribe". 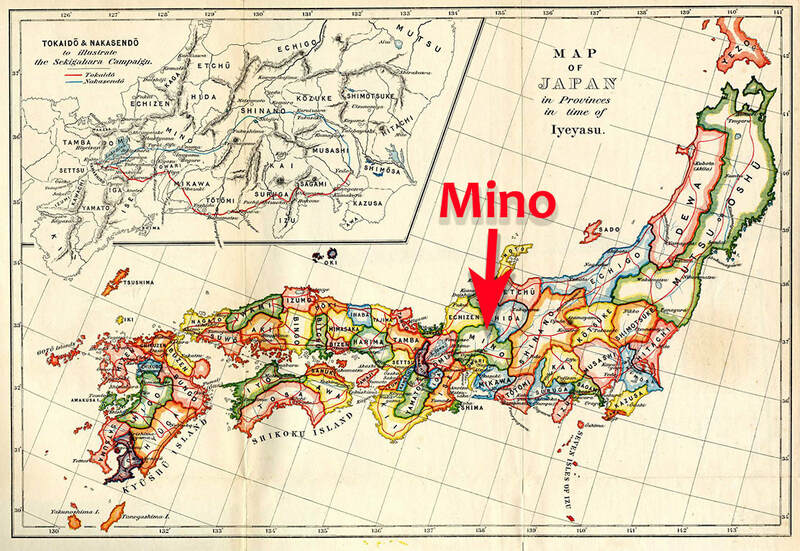 ​According to the accepted theory today, the fourth style in classic Mino ware - Shino - seems to have originated in Mino itself. Ancient pieces of Shino pottery have been discovered in Kani, very close to Tajimi. "It was the Sengoku-era, when the warlords usurped each other. There was a man who's soul was overtaken by the ways of tea and material greed, as he worked his way toward greater power and status. His name was Sasuke Furuta, a subordinate warrior of Nobunaga Oda. With his world broadened by Nobunaga the Genius, and his spiritual insight learned from Senno Soueki the Master of Tea, Sasuke drove road to Hyoge Mono. To live or not to live. For the power or the art. That is the question!!" The retainer is modeled on the war lord Furuta Oribe (1544 – 1615) - a man who has gone down in history as completely obsessed with the design of tea utensils and other things related to the tea ceremony. Yet he also won fame for the revolutionary new sense of beauty he introduced to Japanese pottery. This sense can be felt in much of what we have come to recognize as classic Japanese aesthetics. The warped lines so typical of the way the stepping stones are laid out in a classic Japanese garden, for example, adheres to the same principles. In previous eras, the Japanese nobility had tended to regard Chinese aesthetics as superior, and tried to emulate it when they imported the tea ceremony from the great neighbor nation across the sea. "The Japanese ceramic artist may throw 100 identical tea bowls but when one comes out of the kiln with a crack or a run he will keep that one and toss out the rest as it has been endowed by something special." ​The tea ceremony itself differs greatly between the two traditions. The Chinese tradition centers on the socializing aspect, and is often conducted as part of celebrations, such as weddings. The Japanese “way of tea,” is a largely silent, a highly formalized event, in which every detail is important, from the crockery to the movements of the tea master's hands and the placement and use of each object. Like several others of the great men in this story, Nobunaga, Oribe's first warlord master, was keenly aware of the importance of the tea ceremony and tea utensils in the political power game. He seem to be viewed by many Japanese as a hero, and by others as a villain. What is clear is that he was controversial. He was seen as a bizarre character even in his childhood, when he was nicknamed Owari no Ōutsuke (The Big Fool of Owari). He was an upstart, a burner of monasteries, cruel to his enemies (including the aforementioned Buddhist monasteries) and unfair to his retainers, but also friendly with the nanbanjin ("southern barbarians") - the strange, white people that had began to arrive to the shores of Japan from Europe, bringing with them new customs, knowledge and religion. Nobunaga is a central figure in the history of the Mino region. 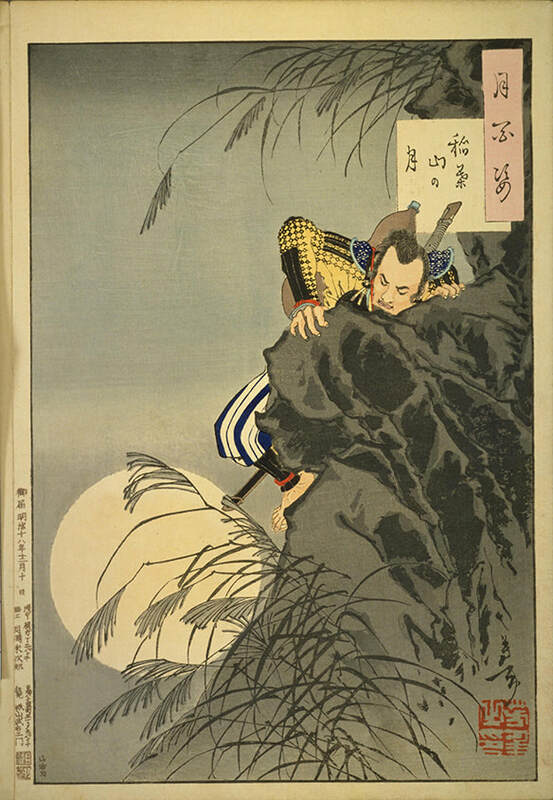 After several unsuccessful attempts, he conquered the ruling clan in their mountaintop Inabayama castle, partly thanks to an audacious commando style raid led by Nobunaga's young retainer Kinoshita Tōkichirō (later known as Toyotomi Hideyoshi). ​​The castle was renamed Gifu castle, and became Nobunaga's primary base and residence. Gifu is today the name of the prefecture here in central Japan, and home to Tajimi and several other city's of great importance to the local pottery tradition. Now we begin to see why Nobunaga became the personal protégé of genius potter Kato Kagemitsu when he fled to Mino in 1574. The objects Kato and other masters produced were invaluable to a cunning, plotting warrior like Nobunaga in a world where tea crockery was connected to status, power and influence. ​What kind of person was he? We meet Nobunaga in an early scene in the film "Rikyu", directed by Hiroshi Teshigahara, about his tea master, Sen no Rikyu (1522 – 1591). The great warlord is offered matchlock muskets by a group of visiting Portuguese, and buys them all. They drink red wine, and there is a black boy in an exotic costume in the foreign company, as well as a big, white poodle. All these novelties look completely out of place in the Japanese setting. Nobunaga wears a European style, heavy red silk cloak with a high collar, on top of his samurai dress. "Do you believe the world is in fact round?" "I couldn't say," replies the man. I have never seen it." "You haven't seen the world?" Nobunaga says, bursting out in laughter. "Oh no," the adviser hastens to say, embarrassed by the ridicule. "What I mean is it looks flat wherever I turn may gaze." "Well, as for me, I believe in this ball!" says Nobunaga. The party continues their stroll, and as Nobugana pass a young retainer, he shouts an order to the man, who stiffens, looking utterly confused and scared. That man was soon going to rule the land. A powerful warlord and an enthusiastic amateur tea man, Oda Nobunaga made every effort to surround himself with tea masters. The image is an artist's rendering of the moments before he meets death at his own hands, in June, 1582, at the Honnō-ji Temple in Kyoto. ​Like many of the important characters in the story about Mino ware, Nobunaga, the great potter's patron, was to meet a violent death. His allies rebelled and surrounded him at a temple in Kyoto, where he perished, possibly by forced suicide. Many ancient, priceless tea ceremony utensils, including objects from the Higashiyama Gyoubutsu (東山御物) from the days of the Muromachi shogunate were lost in the flames of the burning temple. Nobunaga's own remains were never recovered. However, one of the men in that garden gathering, the grand tea master Sen no Rikyu, was to carry on the tradition of tea ceremony in the greatest power house in Japan. 100 Aspects of the Moon #7, Inaba Mountain Moon - The young Toyotomi Hideyoshi leads a small group assaulting the castle on Inaba Mountain. He was later to become the patron of grand tea master Sen no Rikyu. National Diet Library. Public domain. ​After the death of Nobunaga in 1582, Sen no Rikyu and Furuta Oribe were both employed by Toyotomi Hideyoshi, the most powerful war lord in the land now that Nobunaga was gone. It was Hideyoshi who was depicted as that hapless young retainer in the film scene. According to tradition he was of no traceable samurai lineage, being the son of a peasant-ashigaru (foot soldier). Despite of being born without a surname and his peasant origins, he was clever and cunning, and grew in rank under Nobunaga from sandal bearer to kitchen manager, castle builder and eventually one of Nobunaga's most distinguished generals. Nobunaga is said to have referred to Hideyoshi as a "bald rat" multiple times in correspondence with Hideyoshi's wife because of his cheating ways. His less than flattering looks also earned him the nick-name "the monkey", as we can see in this 1591 posting in the streets of Kyoto. ​In the opening scene of the prize awarded film "Rikyu", we see the grand master in the garden in front of his small countryside tea house at night. Dozens of beautiful, blooming white flowers dots the bushes. Rikyu inspects them carefully, and picks one of them. He then tells his disciple to cut off the rest, and enters the tea house. Soon, a small band of samurai comes hurrying up the road through the forest, towards the little tea house. It is Hideyoshi, the "monkey" general himself, and his body guards. The warlord is clad in a garish red kimono, and on his feet he wears golden tabi shoes. When the band enter the garden, Hideyoshi is astonished to see that all the flowers are gone. After a moment's pause, he enters the tea house, bowing deeply to be able to pass through the tiny opening. 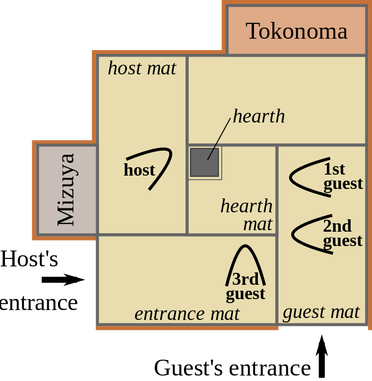 Entrances to Japanese tea houses are designed this way, to force even the most elevated persons to bow in humility as they enter the serene, pure world of the tea ceremony. When Hideyoshi enters the room, he is astonished again to see a single, white flower glowing in the murky darkness inside. Rikyu greets the guest, who quickly compose himself and begins to conduct the tea ceremony, pouring the tea in a bowl and serving it to Rikyu, carefully following the formal procedure. But when the master praise the tea the warrior can't hold back his pleasure, breaking into a big laughter. "Good thing it is, the tea being to your liking, eh?" he exclaims, loudly. When Rikyu takes over the tea serving, Hideyoshi, the farmer's son, can't stop himself from glancing at the master as he prepares the tea, to try to get a hint of how to improve his own technique. Hideyoshi sips from the bowl and is obviously impressed, realizing that his own art has much to be desired. Unfortunately for Rikyu, the warlord was very much aware of the importance of the tea ceremony for politics, which may have led to the Rikyu's death. Hideyoshi eventually ordered him to commit suicide by seppuku. It is not unlikely that the aging warrior suspected him of treason, since he was in constant contact with high level guests as a tea master. ​Since the days of Momoyama, tea had been steeped in politics in Japan. The tea ceremony, the ritualistic serving and drinking of tea, embodies ideas such as the transience and impermanence of life. Those are ideas easily embraced by a warrior culture like that of the samurai in the age of the Warring States, the Sengoku jidai, which climaxed during the Momoyama era. Great sacrifices must be made. Total commitment and loyalty was required. Oda Nobunaga, the great warrior, not only appreciated the aesthetics of the tea ceremony, but also the opportunities for persuasion the tea culture offered. And so did Hideyoshi. ​"During this tumultuous time of civil war, two leading generals — Oda Nobunaga and Toyotomi Hideyoshi — unified much of Japan. Both used tea ceremonies as a political tool in this process: They awarded tea wares for victories on the battlefield, and the tea room was used as a space for liaising and negotiations." It is quite fascinating how an art form as serene and peaceful as the tea ceremony could become so strongly connected with the political power game. At the same time, it must have helped the development of the art form that these wealthy warlords were so fond of the tea ceremony and the ceramics that played such an important part in performing it. By 1590, a year before the Rikyu's tragic death, Furuta Oribe had become one of Rikyu's seven leading disciples. As we shall see in the next installment, he was to leave a great mark on the Japanese pottery tradition. While he probably did not create pottery himself, he is thought to have exerted influence on the development of a revolutionary style that today bear his name - Oribe. 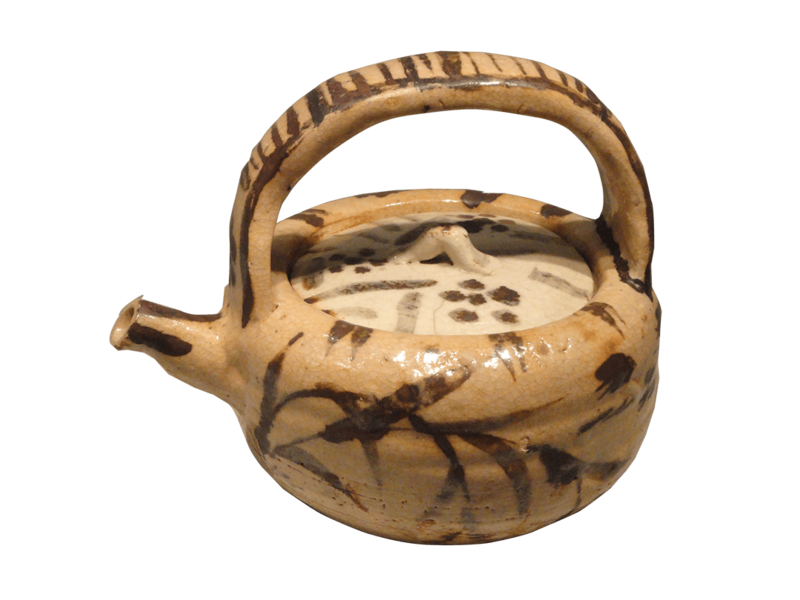 Shino ware suichuu (water-dropper with pouring spout and a handle). Art Institute of Chicago.